Every team has rivalries. The Minnesota Wild are no different. From divisional opponents to playoff kryptonite there is little shortage of headaches for the Wild. Some have gone on since their inception. Others have begun with division realignment. This article will look into only the most intense and significant rivalries that the Wild have developed. The Blue Jackets are the team that joined as an expansion in 2000 alongside the Wild. This would forever cement a comparison between the two clubs. The Wild and Blue Jackets used to be in the same conference, but after the division realignment Columbus is no longer in the Western Conference. The teams don’t see each other often but there are still other connections that keep the rivalry going. Former Wild coach, Todd Richards coached the Blue Jackets for parts of five seasons after coaching Minnesota for two seasons. During that entire stretch he managed only two playoff wins. Both were with Columbus. During his tenure with the Blue Jackets he managed just a .488 winning percentage. Minnesota’s all-time leader in goals, Marian Gaborik, also spent two seasons in Columbus, playing in only 34 games. The team’s name is based on the Mighty Ducks franchise of films. These movies are based in the Twin Cities, where the Wild play hockey. Current Minnesota head coach, Bruce Boudreau, is Anaheim’s former head coach as well. Minnesota and Anaheim’s rivalry did not truly start until the 2002-03 season. This was the first year that the Wild made the playoffs, advancing to the Western Conference Finals. Anaheim blew out Minnesota in the series four games to none. In 2006-07, the Wild qualified again. This time they were bounced in the first round by the Ducks, four games to one. Getting knocked out of the playoffs by the same team in each of your first two appearances is an easy way to start a rivalry. This rivalry is about much more than hockey. The Minnesota Vikings and Chicago Bears have shared the same division for years, forming one of the NFL’s most intense matchups. 1981 through 1993 saw a similar rivalry between the Minnesota North Stars and the Chicago Blackhawks. Together the two teams helped form the Norris Division. 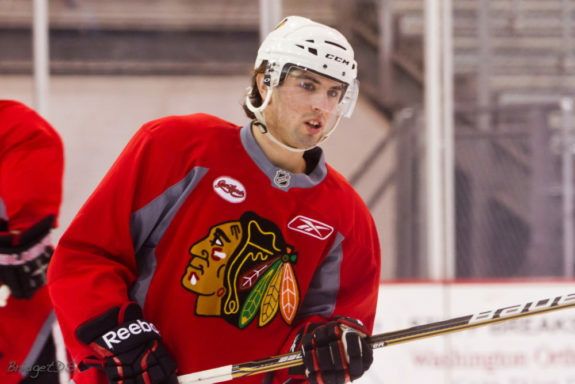 In 2010, the Wild traded a young prospect by the name of Nick Leddy. It was tough to watch the young defenseman flourish in Chicago, while Cam Barker playing a cool 71 games for the Wild, mustering 12 points. Having such a one-sided trade only adds fuel to the fire. Beginning with the 2012-13 NHL season, the Wild and Blackhawks were placed inside the Central Division. This reunited the Minnesota-Chicago rivalry that had been missing for years. The close proximity between the two clubs made it a no-brainer to reignite the feud. In each of the division’s first three seasons, the Wild and Blackhawks met in the playoffs. The Wild lost the first time in the first round, four games to one. The following year they lost in the second round, four games to two. In the third and final meeting (so far) the Wild were blown out in the second round, four games to none. Vikings head coach Mike Zimmer once said in response to the Vikings-Packers rivalry, “We’re still trying to make it a rivalry. In order to do that, you’ve got to keep winning.” Not sure if we can yet classify the Wild-Blackhawks games as rivalries, when the competition seems so one-sided when the games matter most. 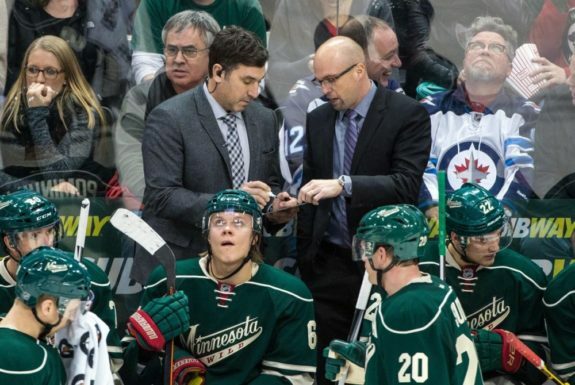 St. Louis possesses the Wild’s former coach, Mike Yeo. Yeo helped lead St. Louis to a series victory over Minnesota in the first round of the 2016-17 playoffs, four games to one. A series loss in the playoffs, as well as being in the same division are an easy way to move up the ranks into a team’s top rivalries. The Wild were able to knock out the Blues in the first round of the 2014-15 playoffs, winning four games to two. In addition, former Wild player Kyle Brodziak spent two seasons with the Blues. Related: Smart Decision Choosing Boudreau over Yeo? Colorado is actually the lone team to be in the same division as Minnesota since the franchises inaugural season. The two teams have one of the most entertaining rivalries in hockey because they each have a solid history against one another. In 2002-03 the Wild were down three games to one in the series before making an epic comeback. Brunette’s goal to shoot Minnesota into a second round matchup is still the most significant moment in Wild history. The Wild have since met the Avalanche two more times in the postseason. The two teams battled again in the 2007-08 playoffs, with the Wild being bounced in the series four games to two. In the 2013-14 playoffs, the Wild took the series from Colorado four games to three. During the overtime period in game seven, Nino Niederreiter scored the series winner. 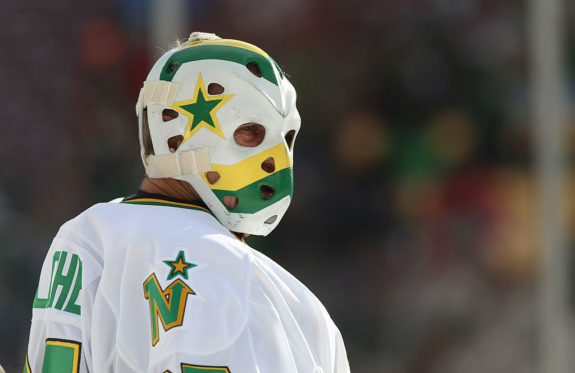 It’s due to the Dallas Stars that the Minnesota North Stars are no more. Norm Green or “Norm Greed” decided to move the team to Dallas with one of the most prominent reasons being a sexual harassment lawsuit. Among other issues cited were low attendance and refusal to play games at the Target Center in Minneapolis. The teams only recently became divisional opponents. They have also only met in the playoffs once, during the 2015-16 season. The Wild were eliminated in the first round, four games to two.